In Tuesday's Albany Times-Union, columnist Chris Churchill eloquently decried the shameful glee in some corners for Antonin Scalia's death. Whether one cared for Scalia's opinions or even for him, all decent people with any sense of humanity are saddened by the death of a dedicated public servant. As I have repeated in different ways, I wish him the eternal happiness of his religious faith. Let's take a look at Justice Scalia's record. Neither a sympathetic nor a hostile look. Just a straightforward, unvarnished survey of some of his most significant judicial opinions on the major constitutional issues of the day. Some may hail these opinions; others may deplore them. Some may view them as appropriately faithful to traditional values and to original constitutional meaning; others may view them as reactionary. Some may see them as honest, neutral applications of the law; others may see them as personal beliefs and preferences cloaked in an expedient judicial philosophy. But whatever one thinks of these opinions, they are his. I have previously made clear my own unfavorable view of his jurisprudence. No secret there. But that is irrelevant for this survey. What is relevant are the positions Justice Scalia took in his opinions. His actual positions on critical constitutional issues. Not the gibberish we've been hearing from many politicians and commentators who seem utterly unfamiliar with Scalia's actual record. In fact, it is doubtful that most conservative politicians and commentators, who claim great admiration for the Justice Scalia, would really be willing to publicly embrace many of the positions he ardently espoused. And doubtful, as well, that most liberal politicians and commentators would really have any credible rebuttal to Scalia's call for adherence to what the Constitution says and to what meaning was intended. Obviously, a full exposition of the cases and Scalia's opinions over his 30 years on the Court would take a volume or volumes. So here are a few: the unadorned rulings of the Court--i.e., the resolution of the major constitutional issues presented and the rules of law settled or adopted by the Court--and the positions taken in those cases by Scalia, whether in majority, concurring, or dissenting opinions. Oregon v. Smith (1990), majority opinion by Scalia: "any otherwise valid law" defeats a claim of religious liberty. The 1st Amendment does not entitle a religious objector to an exemption "from obedience to a general law," otherwise "'every citizen [would] become a law unto himself.'" 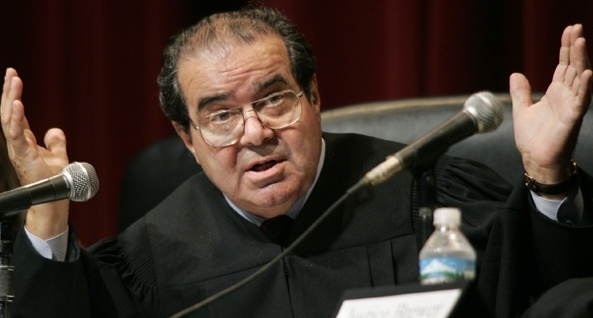 [N.B., some additional discussion of Smith is particularly called for because it is such a consequential ruling and because, almost certainly, it would be shocking to many conservative admirers of Justice Scalia who may not be so familiar with his record. Justice O'Connor and two other Justices vehemently disagreed with Scalia's position in Smith. They argued that, consistent with the Court's precedents and its treatment of other fundamental rights, religious freedom could not be abridged unless government had a compelling reason to do so, e.g., forbidding human sacrifice, requiring medical care for gravely ill children, etc. As a a result of Scalia's majority opinion in Smith, free exercise of religion is the only 1st Amendment right that is not protected by the "compelling reason"/"strict scrutiny" test. Congress passed a statute (the Religious Freedom Restoration Act [RFRA]) to overrule Scalia's opinion and to restore the "compelling reason"/"strict scrutiny" test. That statute now protects religious freedom from federal--but not state--laws. In Burwell v. Hobby Lobby (2014), where the Court majority (including Scalia) did exempt the religious objectors from purchasing contraceptive insurance coverage under the Affordable Care Act, it did so by applying the statute--not the 1st Amendment which would have provided no religious protection because of Smith. As a continuing consequence of Scalia's opinion in Smith, there is no 1st Amendment or federal statutory protection for religious freedom from any "otherwise valid (state) law"--i.e., a law that is valid without regard for the religious objection. District of Columbia v. Heller (2008), majority opinion by Scalia: the 2nd Amendment guarantees an individual right to bear arms. The "prefatory clause" of the 2nd Amendment (i.e., “A well regulated Militia, being necessary to the security of a free State") "announces the purpose" of the Amendment, but it "does not suggest...the only reason" that Americans valued the right to bear arms. Instead, at the time of the founding, most Americans "undoubtedly thought it even more important for self-defense and hunting." [Scalia's textual and historical analysis rejected the position of the four dissenters who argued that a natural reading of the 2nd Amendment, together with its acknowledged military purpose and the Court's previous decisions, compels the opposite conclusion. That is, that the 2nd Amendment was adopted only to protect the right of the people in each state "to maintain a well-regulated militia"--not for individual self-defense or hunting. In Part 2, we'll take a look at a few of Scalia's significant opinions on questions of constitutionally guaranteed equal protection.